We are so excited to announce our MOM (Motivating Mom of the Month) for June! Each month we will take a moment to honor one of our local FIT4MOM LSBWK NoVa Moms for her efforts to lead a healthy lifestyle and for her dedication to the program. 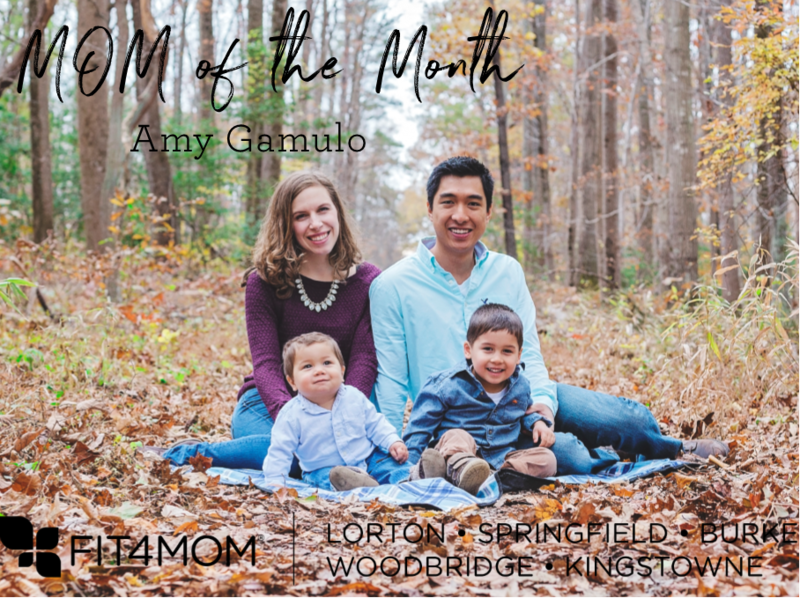 This month we honor Amy Gamulo from our Burke village! I have made some great friends since joining Fit4Mom and Amy is definitely one of them! Pushing a stroller with 2, sometimes 3 kiddos, challenging herself physically during a workout, and making everyone she meets feel included and special…all with a big smile on her face! This lady has got it going on! I admire her on the daily for the kindness, humor, and strength she radiates! I always look forward to working out, chatting, and laughing with her almost every day during and after class. Thank you Amy for being YOU! Love ya! Amy is our resident pun queen! We are so happy she decided to join us and share her killer humourand workout skills with us last year. Since then, she’s added to her crew by caring for her niece each day and we are so impressed that she is juggling three kids on a regular basis. Amy, thanks for keeping us laughing and thank your kiddo for keeping my kid entertained during class! I grew up near Ottawa, Ontario, Canada and moved down here five years ago to be with my husband. I go home occasionally to stock up on maple syrup! I joined FIT4MOM in March 2017. I am almost always at the Burke Stroller Strides and Barre classes on Tuesdays, Thursdays and Fridays. My four-year-old, Teddy, gets so excited when I tell him it's an exercise class day: he loves seeing all his FIT4MOM friends! Who is your workout buddy and their age? My tagalongs are Teddy (4), Charlie (1.5), and my niece, Ellie (4 months), who I watch during the day while my sister is at work. Just one?! The people. The workouts. The motivation. The instructors. The bonds. The sharing. The baby holding. The Moms Nights Out. The inclusion. The squats. The squats. The squats. The bubbles! The field trips! The Village. I was a teacher, a lifetime ago. Then I worked for the International Monetary Fund when I moved here. I didn't want to like FIT4MOM. I didn't want to be part of a moms' club! But after my first class, I couldn't stop thinking about the group of moms who seemed so tight. I wanted (needed!) to be a part of that! And now I am (sorry, Candice, for being a part of such a close-knit village that I sometimes chat during class!). Ugh, declutter the house, without "helpers." Yes, I'm that kind of exciting. ...the people around me are happy. And the house is clean.